With a lifespan of approximately 50 years, it’s important to select a metal roofing color that will continue to boost the curb appeal of your home. Light Considerations: Review metal roofing samples at various points throughout the day. They will appear brighter when the sun is higher in the sky and more muted at dawn and dusk. Be sure you find all scenarios appealing prior to committing to a color. Tie Into Your Home’s Preexisting Features: Color selection should take into consider elements already in place on the exterior of your home. Things such as covered gutters, window trim, siding, landscaping, and front door. This approach will present a consistent and consolidated look for years to come. Lighter Colors: A lighter metal roofing color will create the illusion of a taller home. This approach works well for lower or shallower pitched rooflines. Bear in mind that lighter roof colors are significantly cooler than a darker roof. Therefore, a lighter roof can do a better job of insulating your home on sweltering summer days. Darker Colors: The selection of a darker metal roof color will make a towering roof appear less staggering. However, if your roof is larger than average, a darker color may overwhelm the other exterior features of your home. With regards to energy efficiency, darker metal roofing in Minnesota can be utilized without concern as long as the attic’s insulation and ventilation have been installed correctly. Your Home’s Architecture: Neutral and darker colors work well on homes with a traditional architectural style. Modern homes allow for bolder choices, such as black or metallic. Have a Victorian home? Opt for historically accurate browns and bronzes. Greens, browns, and tans bode well for bungalows, cottages, and craftsman home styles. Gray tones are an excellent choice for cape cods and colonial homes. Surrounding Natural Features: Elements such as stately trees, prairie grasses, and water frontage should also be considered prior to committing to a metal roof color. Just like exterior home features, these natural features contribute to the exterior aesthetics of your home. Your Neighbors: Rarely is it a good thing when you give directions to your house by stating it’s the only one in your neighborhood a certain color. Select a roof color that plays into your neighborhood’s color palette or be prepared to be have a home that’s perceived as an eyesore for the next 50 years. Learn why this Crystal, MN homeowner opted to replace his asphalt shingles with a metal roof. "Very pleased with the finished product, easy to work with, and knowledgeable." - Bob L.
"Got my roof replaced in a timely manner and on schedule. Workers were very careful of my shrubs and cleaned up area every night. I get a lot of compliments for the great job they did." 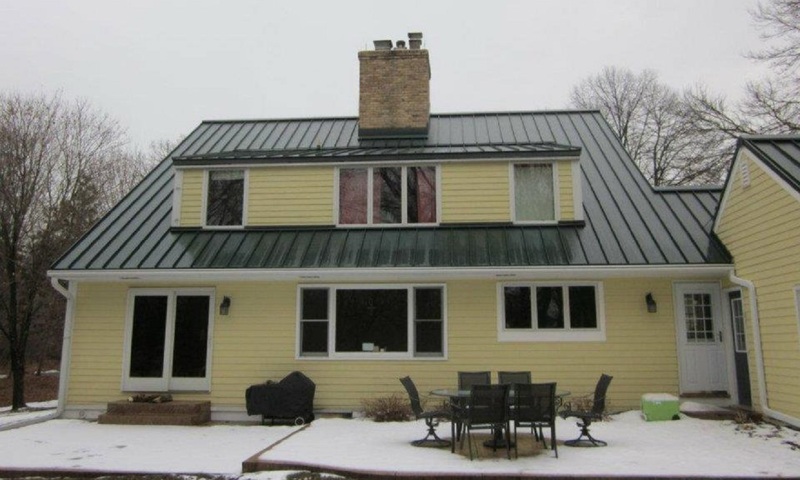 - Patsy L.
"Lindus installed my metal roof a couple years ago. They did an excellent job." - Phil O. "We are enjoying our Lindus metal roof. It is warmer, snow came off easy & it's very quiet. I recommend it." - Gary A. "I have had Lindus Construction install my doors and a metal roof. Love that they are local and stand by their work. Loved them so much I had them come back to do my LeafGuard® Gutters!" - Rhonda L.
"Excellent crews and workmanship!" - Court S.